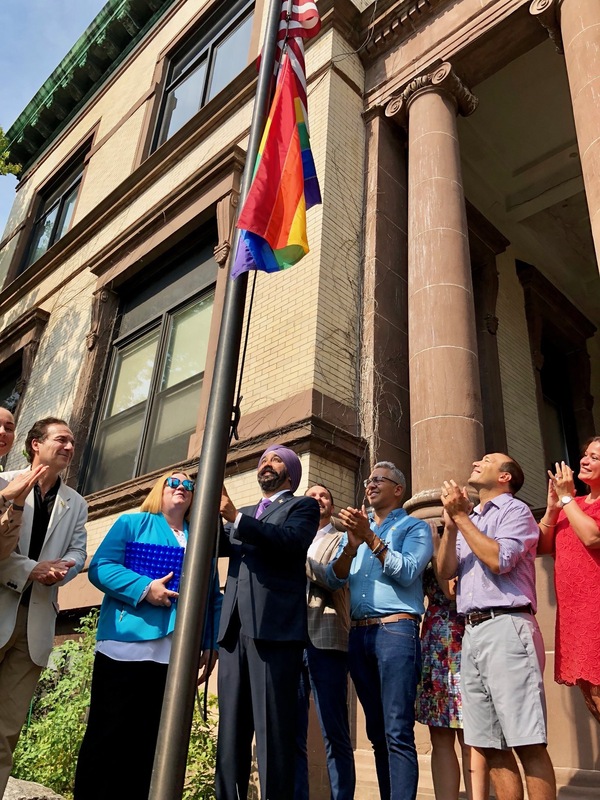 The City of Hoboken on Monday kicked off its inaugural Hoboken Pride Week with a flag raising ceremony. At the ceremony, Hudson Pride Center CEO Michael Billy presented Mayor Ravi S. Bhalla with the organization’s Evolution Award. Bhalla is the only elected official to have received this award. At the ceremony, Bhalla announced the selection of Laura Knittel as Hoboken’s LGBTQ Community Liaison. In this volunteer role, Knittel will serve as a resource for the public to raise concerns related to the LGBTQ+ community. Knittel will meet with Bhalla as needed to present solutions to these concerns. Hoboken Pride Week is part of the first-ever Hudson Pride Month, with events happening across Hoboken, Jersey City, and Bayonne throughout the month of August. For more information, visit https://jerseycitypride.com/upcoming-pride-events/.